Orkut launched scraps on mobile feature. But unfortunately people are getting charged by mobile service providers for those messages. 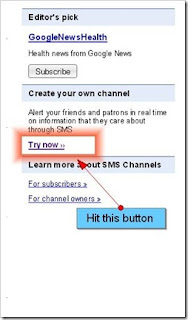 So, here I’m going to tell you the trick to receive Orkut scraps on your mobile as SMS absolutely free. Each time someone sends you a scrap, you will get a SMS alert with first 150 characters of that scrap on your mobile. This service is absolutely FREE for people living in India. 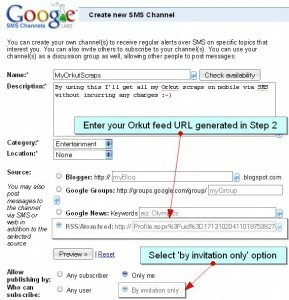 We will perform this trick by using Orkutfeeds and Google SMS Channel. Let’s know how to do this. This orkut trick can be done by converting all your scraps into a feed. Now associate that feed with a Google SMS channel. When someone makes a scraps in your scrapbook, your scrapbook feed will receive and store that scrap. Google SMS channel checks scrapbook feed periodically and will send you the scrap by SMS once it find a new scrap in your feed. I will make it a bit more simple. Follow the below steps. 2. 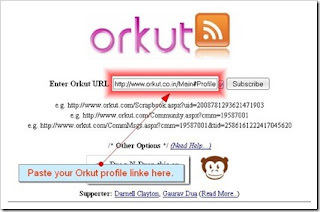 Go to Orkutfeeds.com, paste your Orkut profile link in the given box and click on theSubscribe button. Check out the below screenshot. 5. Now navigate to Google SMS Channel and login with your Google/Gmail ID and Password. 6. Look at the right sidebar, you can find a Try now button under Create your own channeloption. Click on Try now. It will take you to the channel settings page. Fill up all the details there and click on Create Channel button. Check the below screenshot for complete instructions. Now you will receive Orkut scraps by SMS absolutely free. 1. If your scrapbook is locked (viewable by friends only), you MUST add Orkutfeeds Bot as your friend on Orkut. Add Orkutfeeds bot. 2. It might take up to 4-6 hours to get new scrap notification SMS on mobile. This fully depends on Google server load. This is nice post.Thanks for sharing.